Polarization can improve image quality in low light conditions and provide a major benefit to vision applications. Often, lighting conditions and the type of object under inspection prevent vision systems from producing the best possible image. Excessive light, reflections, haze, or shiny materials can have a negative impact on the image quality; therefore, these conditions affect the results of both the image analysis and the inspection. Polarizing filters or sensors reduce the glare; reduce surface reflections; and, increase the clarity of structures, defects, and shapes. The filters eliminate reflections and light refractions, in a manner that is similar to sunglasses. Images as a result, are clearer, more vivid, and have greater contrast. What is Polarization and What Does It Achieve? 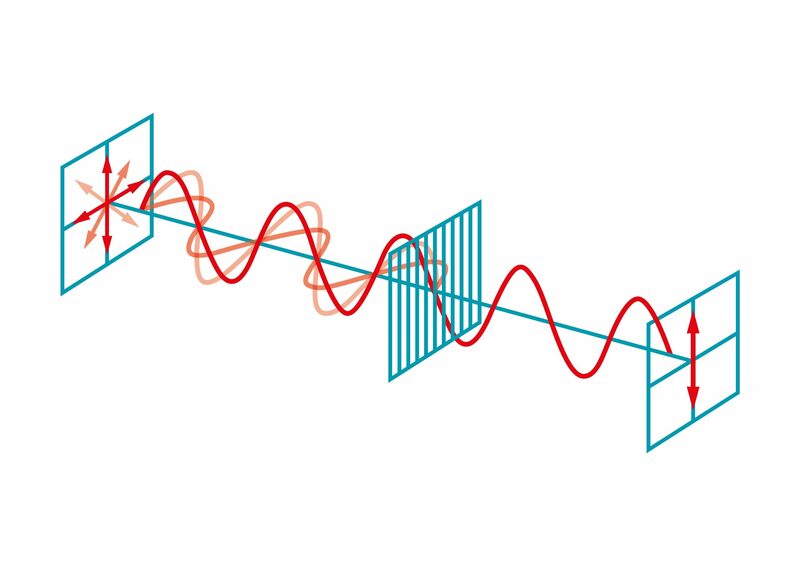 In physics, light is defined as electromagnetic radiation; in other words, a wave. The polarization of a wave describes the direction of the amplitude of the electromagnetic field, and the oscillation of the light. A distinction is made between linear, circular, and elliptical polarized waves. Generally, in image processing, polarization refers to linear polarized light. On earth, light is not naturally polarized, and light waves oscillate equally on all planes. Non-polarized light hits objects and surfaces in different states of oscillation and at different angles (see Figure 1). 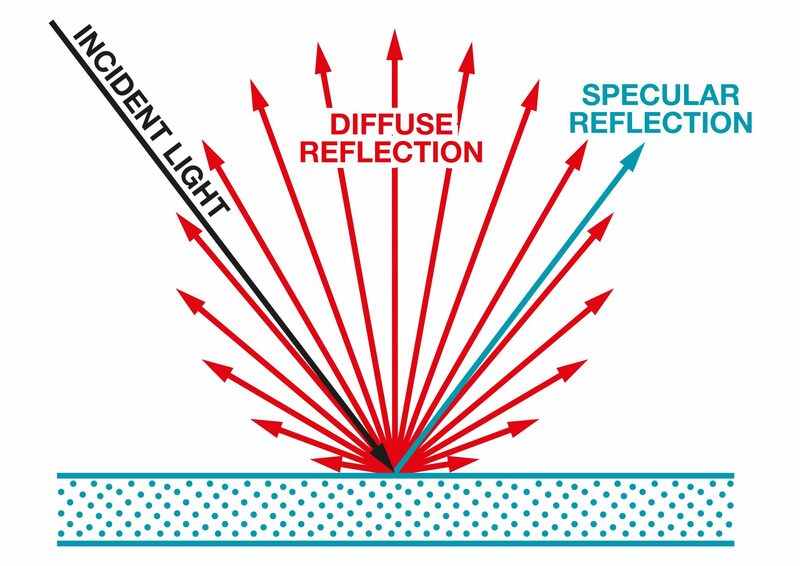 Then, the light can be reflected or scattered, and produces unwanted glare effects, flashes, or patches of light in image processing. These artifacts can impair or conceal important image information and compromise the analysis of captured images, and the inspection of the objects. Polarizers filter out light waves that move in a specific direction, or on a certain polarization plane. This characteristic corresponds to approximately 50 percent of the unpolarized light reaching an object or surface (see Figure 2). If light is mirrored in a surface, one polarization plane is reflected to a greater extent than the other. A correctly optimized polarizer only allows light which is not being mirrored; therefore, this process clarifies the view of the image. These properties allow polarizing filters to be used for reducing reflections and make the image "behind" the reflections, visible. Figure 3 shows how a polarizer can reveal the rocks below the surface of the water (see figure 3). Polarizing filters are ideal for both monochrome and colored images, because they do not affect the color of the image that is being examined. Shape recognition when contrast levels are low – In low-contrast environments or where there are several dark objects, it can be difficult to distinguish object boundaries and shapes. Polarizing filters improve contrast and present the object more accurately, which makes it possible to identify forms and borders. Scratch recognition – The increased contrast provided by the polarizer highlights surface scratches and helps identify defects in quality control scenarios. Eliminating reflections – When reflected light blocks viewing of the image, a polarizing filter can remove reflections and produce a perfect image of the object. Simultaneously, glare is eliminated to reveal parts of the image previously obscured. Distinguishing different directions of light – Polarizers can help to identify the normal direction of light and differentiate between vertical and horizontal light. This feature is helpful to determine the source of light. Therefore, it is possible to eliminate both reflected light, and identify other properties of the light source. Polarization can be applied in different ways to vision systems to improve image quality, and to allow more accurate image analysis. One approach is the use of a standard image sensor and a polarizer. Traditional polarizing filters similar to those used in photography, are placed in front of the lens or on the light source, and they can be rotated to change the polarizing direction. If a complete image from multiple polarization directions is required, several sequential pictures with different polarization angles must be taken, but consequently slows down the vision application. However, in conventional machine vision applications, only one image with the best suitable polarization angle is required. A rotatable filter is mounted in a frame and affixed onto the lens. The rotation of the filter permits the optimum setting with the greatest contrast and no observable reflections. In addition, if ambient light needs to be filtered, another polarizer or polarizing film can be placed in front of the light source. When the polarization planes of the lens and the light source are in parallel with each other, this combination results in the brightest possible image with the elimination of the non-polarized ambient light. Usually, this solution can be set up easily, quickly, and can be applied to existing systems. Depending on the environment, the lifespan of the filter may be reduced by external factors. Normally, polarizers that are fitted to the sensor (i.e., on-sensor filters), are made of glass and consist of four different filters that can align with the sensor at 0°, 45°, 90°, and 135°. The angle of the polarized light and the direction of polarization can be precisely set. Glass filters are reliable and can be fitted to sensors of any wavelength. The filters are mounted on the sensor permanently and integrated into the vision system. The lifespan of the filters, which are protected from the external environment, is longer than that of external polarizers. The speed of the application remains unchanged because all polarization data can be recorded immediately. However, resolution is lower due to the addition of the filters, and the splitting of the pixels by different polarization angles. Additionally, the 4D polarizers that are fitted directly to the pixel (i.e., on-chip polarizers) have four filters every 45 degrees, but they are mounted directly on each pixel inside the sensor. Therefore, variable data from four polarization angles is recorded simultaneously. Afterward, the polarization can be reconstructed from the different intensities of the four filtered pixel angles. This method enables the amount and the angle of the polarized light in a scene to be accurately identified. Sensors that are currently available on the market, like the SONY IMX250, cover a wavelength range of 400 nm to 850 nm. They are very reliable, easy to use, and have a very long service life. Unlike conventional polarizers, filters inside the sensor reduce reflections from different directions. 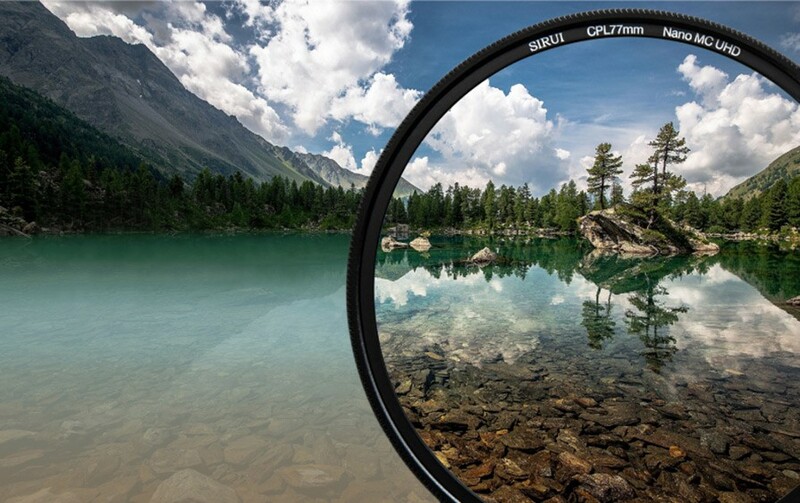 Polarizing filters are a simple and fast solution for improving image quality. They eliminate the effects of reflections and glare on surfaces like glass, plastic, and metal in many vision applications. In particular, inspection results can be significantly improved by polarizing filters in industrial quality assurance, traffic and infrastructure systems, and medicine. Polarizers can eliminate reflections on reflective surfaces or increase the contrast in industrial and automated systems. It allows images to be recorded through transparent but reflecting surfaces. Therefore, products wrapped in film or plastic can be measured and inspected through the packaging. In addition, the filter can suppress the shiny effect of metals by making the surfaces significantly darker. This property of polarizers makes the reliable analysis of even shiny cylindrical or curved objects possible. The increase in contrast described above and the degree of polarization means that shapes and parts can be recognized and clearly distinguished in poor light conditions. Consequently, the degree of polarization can make scratches visible, too. In addition, polarized light enables the analysis of the distribution of stress in transparent plastics. Therefore, material stresses, tensions, and other related problems can be identified more quickly by measuring the internal strains. For example, air bubbles in plastic bottles, defects in films, or in cast or extruded plastics can be reliably detected with polarizers. Polarizing filters implemented in intelligent transport or traffic monitoring system can identify a person behind a window in a vehicle when the glare on the window or windscreen would normally prevent an image from being detected and recorded. The option for determining the direction of light in traffic and transport applications is very useful when there is a need to identify the source of lights in darkness or at dusk, and to prevent reflections. Autonomous cars can benefit from improved road detection functions in all types of light conditions by recording the flat surface of the road with polarization filters. Direct polarizers or those installed in the sensor, offer totally new measurement methods and applications for drones. The simultaneous recording at the aforementioned 4 angles of polarization allows the benefits of polarized light in more compact, fully integrated vision systems. Drones, and in principle, infrastructure applications, can use polarizers to detect objects under water by eliminating the reflections on the surface of the water. One industry that can benefit from this type of implementation is agriculture. The growth and readiness for the harvesting of rice in paddy fields can be assessed cost-effectively from the air with a single camera. Polarization improves the detection of objects in every respect by making additional image data visible. In many applications, it can be easier, quicker, more cost-effective, and more reliable to invest in polarizing filters. Polarization is a superior alternative to struggling with complex lighting solutions or using tactile processes. Special polarizing sensors are slightly more expensive than standard sensors. However, the small additional expense in the initial investment is quickly compensated by the ease of use and the reliability of the solutions. The benefits of polarization compared to tactile sensors are even more obvious. In addition, external polarizers can be retrofitted to existing applications. Users who need images with greater contrast or want to eliminate mirroring or reflections should definitely test a set-up with polarization. The on-chip variants of this technology can be easily used for compact, smart, embedded vision applications.